Tetramorium Immigrans: one mated pavement ant queen, plus any brood she has produced in-season (0-10 workers). One of the most commonly seen urban ants in Canada, these are readily observable in the wild for their habit of forming nests in the exposed places such as the cracks of pavement, in open areas with sand or soil, under stones, and sometimes in rotting wood. They will often have tiny mounds around the entrance hole. 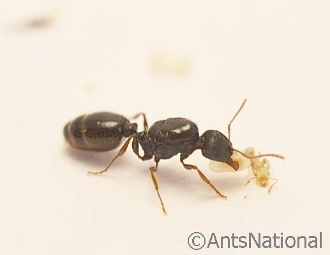 These ants grow quickly and can be aggressive: in addition to a general diet of honey-water this species will need supplements of dead insects for food. Queens are 6-8 mm in length and workers are 1-3 mm. Your queen will arrive with 0-10 eggs and/or workers in the colony, depending on her speed of laying and the length of time since she had her nupital flight. She will be shipped in a secure, standard test tube starter chamber with access to water, a bit of sand, and a removable plug for feeding her. This simulates a founding burrow, and this habitat must be kept dark. She can live in this starter tube for up to 6 months, before which she will need to be moved to a larger formicarium to start her colony. Your queen will come with detailed care instructions including feeding and husbandry, hibernation (2-3 months a year), and other rearing advice. We also include a FAQ and some interesting ant facts for your project. Formicarium sold separately. Feeding bowl and pipette not included. Ants are seasonal: we usually sell out by November. The queens are ethically collected in warmer moths, and are available until we run out, which will be noted in this description. If you see a sold-out note here, but you are interested in pre-ordering ants for the following season, please proceed to the cart as normal and note in Special Instructions that you are placing a pre-order. This will guarantee availability when we get them back in stock. Please note that ants are a long-term project: queens can live for decades. You'll need to prepare to have a pet for years: if you are not sure you are ready for this, please make an inquiry before purchase and we can send you the instructions or answer any questions you may have. We only offer our ant replacement policy on ants who are housed in our handmade formicarium. If you intend to buy ants and house them otherwise, they will not be guaranteed. Your ants cannot be released outside.